A Congratulations Cake from Carlos Perez! I met the very talented and charming Carlos in Montréal back in October at Appetite for Books. 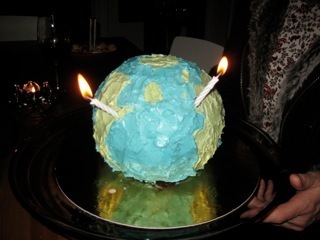 Here are two photos of his incredible cake: Félicitations Rose ! Can't say I'm really surprised about RHC's nomination- it is sincerely a remarkable work of art that benefits so many people. 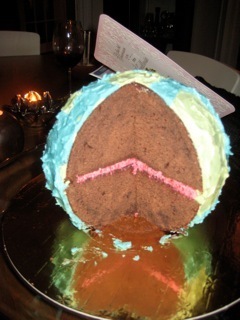 And so in honor of you and your oeuvre, and since the event will be taking place on Earth Day, here's a picture of a cake I baked for a friend's birthday last year : Chocolate Butter Globe with raspberry "lava" + buttercream oceans and continents. (The 2 candles represented my friend whose birthday we were celebrating here in Montreal and the other was for her lover who was in working in Dubai and whom she missed terribly.) Here's hoping that this image will be some kind of omen come April 22nd !